You'll be £11.99 closer to your next £10.00 credit when you purchase Deadlier than the Male. What's this? How much influence did notable wives have on the leading commanders in British military history? These women tend to be disregarded but, as Trina Beckett demonstrates in this revealing and thought-provoking study, their influence has often been profound. 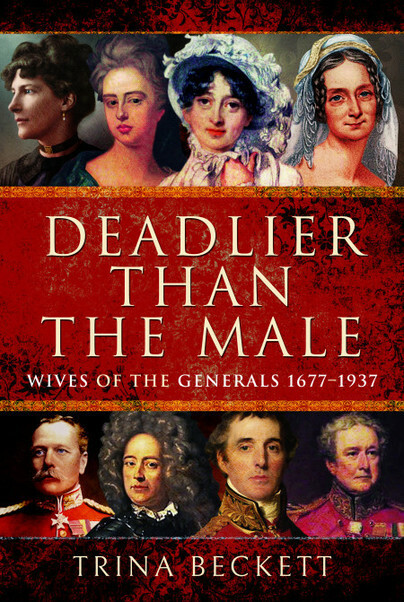 Taking examples from the eighteenth century to the Second World War, she uncovers a hidden dimension in the rise to prominence of some of Britain’s most famous soldiers and documents a series of fascinating relationships between powerful men and equally powerful women. Sarah Churchill, Duchess of Marlborough, and Dorothy, Countess Haig are perhaps the most famous examples of wives who played important roles in their husbands’ brilliant careers. However, sometimes the lives of leading commanders would be hindered as well as helped by their wives. Paulina Wood proved such a disastrous hostess that she almost destroyed the career of Sir Evelyn Wood, and Lord Robert’s reputation for jobbery owed much to his wife Nora’s constant interference in appointments. Trina Beckett’s perceptive and absorbing case studies reveal much about the women whose lives she portrays and the contribution they made to their distinguished husbands’ military careers. Although some of the names were new to me, I did enjoy the chapter about Kitty Pakenham, wife of the Duke of Wellington. Descendents of the Duke still live at their country estate in Hampshire, close to where I live. I was also fascinated by the chapter about Dorothy Haig and her role in creating organisations that helped soldiers and their families who were injured in the first world war.